How to Mass Convert media to H.265 on Mac/Windows? According to some popular forums, we found many people asked “ how to bass/batch convert video to H.265 on computer”. 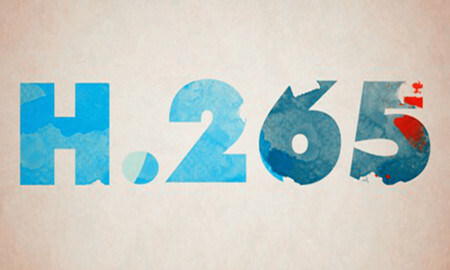 Ok, today we share you the easy way of converting video to H.265 quickly. Wide Selection of Formats Supported – Converts any video files to MKV, AVI, MP4, MOV, 3GP, WMV, and a lot more. Fast – Speed Video Converter: Brings about conversion at seed of up to 6X. Lossless Conversion -Convers any video files without the risk of losing its original quality. 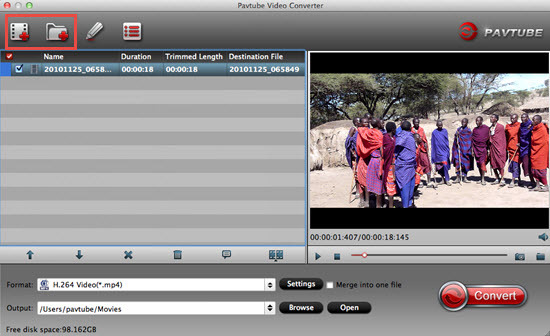 Custom Video – Personalize videos with diversified video editing tools. Mac version is compatible with macOS Sierra, El Capitan Yosemite, Mavericks, Lion. Windows version is compatible with Windows 10, Windows 8.1, Windows 8, Windows 7, Windows XP. Step 1: Click “File” button to load your H.265 video from local media library. And go to “Merge into one File” tab to merge several video files into single one for mass/batch converting video to H.265 video. 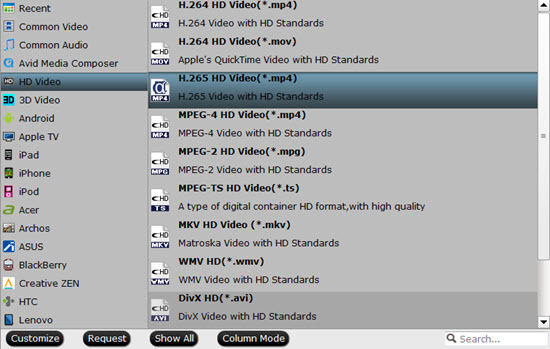 Step 2: Go to Format -> "Common Video" or "HD Video "-> H.265 (HD) Video. Tip 1: By clicking “Edit selected task” button, you can trim, crop the video, or add watermark, adjust effect, attaching subtitles for pre-editing your video files. Tip 2: Go to “Setting” tab to adjust video bitrate/codec/resolution and more. Step 3: Tap button “OK” and hit “Convert” to start converting video to H.265. HEVC, developed by the Joint Collaborative Team on Video Coding (JCT-VC), stands for High Efficiency Video Coding (well known as H.265). It is an advanced video compression standard and a successors of the widely adopted H.264 (aka MPEG-4 Part 10, Advanced Video Coding or MPEG-4 AVC).